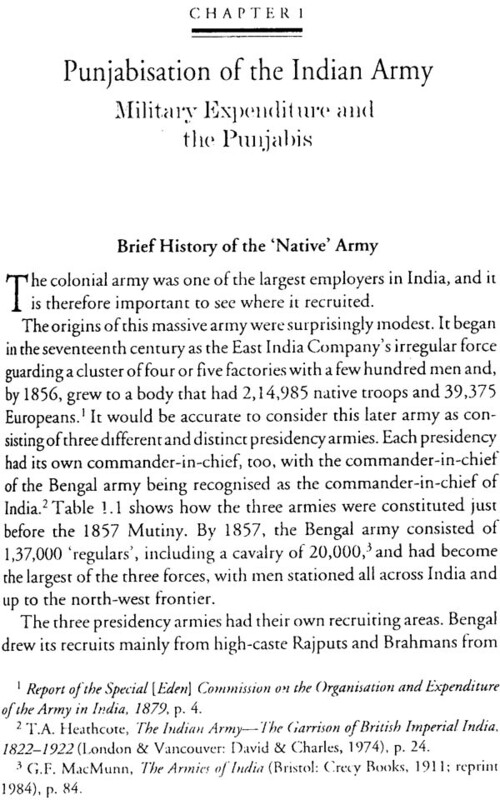 The British Indian army was predominantly a 'native' army. Britain's Indian empire was conquered by that army and colonial rule enforced by its substantial might. A native force, thus, was trained and armed to control less-conciliatory natives, and it loyally served the colonial state right up to independence. It fought two world wars and numerous other campaigns within and outside the subcontinent. 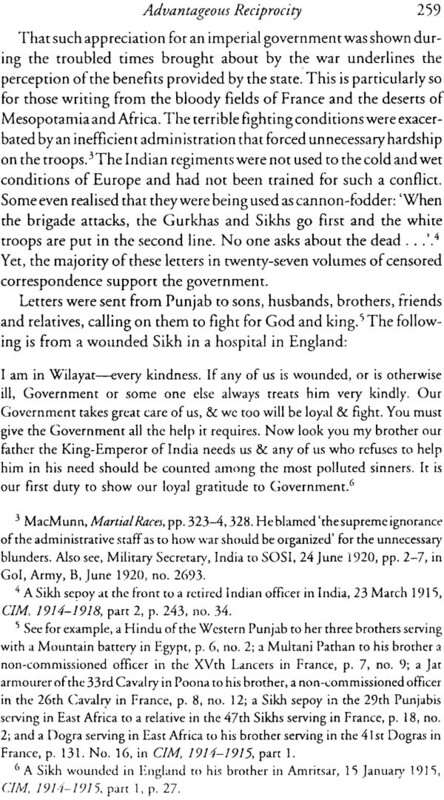 This 'British' Indian army also suppressed countless local infractions, often involving Indians opposed to the colonial government. The imperial masters of this native force had to ensure that the army remained loyal. This imperative forced the colonial state to pursue a relatively benevolent policy when dealing with militarised men, and within militarised regions. Government initiatives were aimed to protect the interests of recruited groups and enhance their local standing. Moreover, the British government had to tread very cautiously when dealing with mass agitation in regions of high recruitment. This contradiction-that colonial rule was based on the might of a foreign state, and that this coercive state's power was represented in a native army raises important historical questions. Why did Indians join an imperial army and serve it so loyally? How did the colonial state co-opt Indians to voluntarily enlist in its regiments? Did the Indian national movement not affect Indian soldiers? Was the freedom struggle adversely affected by a collaborating peasantry and a native army? These issues concern the nature of colonialism and nationalism in relation to the wider ramifications of the existence of a native armed force within colonial India. Three categories are investigated in this book: the army; colonialism; and nationalism. The army has usually been studied in solely military terms. It continues to be perceived as removed from society: it has been (and still is) segregated. Most histories of the Indian army are of its development from earliest days, its constituent regiments, its various campaigns. The location of the army in its wider social context has been somewhat neglected. However, the armed forces under any political organisation-ancient and medieval kingdoms, imperial states, modern democracies-are deeply rooted in civilian society. The troops that form the fighting corps are members of that society. Soldiers are social, economic and political units, both individually and as a group. The army and military personnel influence society and politics despite being specifically excluded from the civilian sphere. Military policy is, after all, state policy, and steps that affect military men are part of government policy. On the other hand, soldiers are conscious of their special position as members of a critical institution of the state. They realise the many advantages of soldiering and are aware that these can be withdrawn. Therefore, they respond to specific issues in terms of their affiliation to a corporate body, and not just as individuals. In particular, military men form an important vote bank in regions of high recruitment, and thus affect politics. 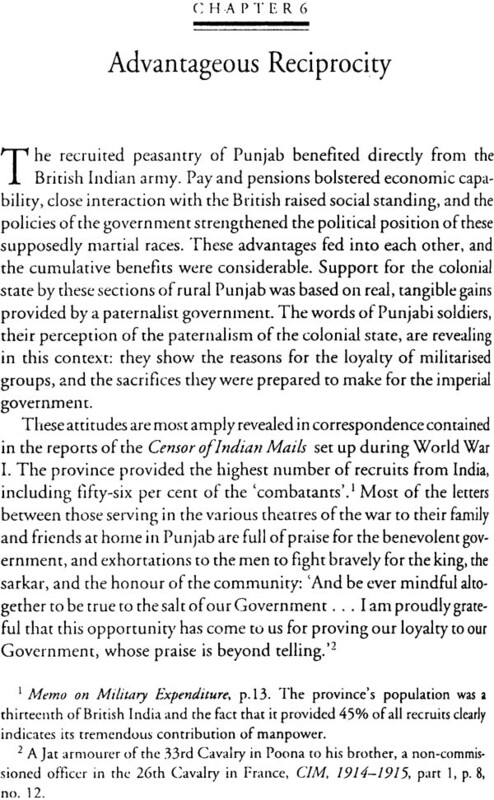 The following pages analyse how the Punjab-centric military apparatus of British India affected provincial politics-both in terms of colonial policy and in relation to the political behaviour of Punjab's recruited peasantry. This book also considers the nature of colonialism in Punjab and the impact of the colonial state on a substantial section of Punjab society. The army affected the British government not merely in relation to military policy. The paradox of foreign power maintained by locals in uniform influenced state policy, particularly in the recruiting grounds. Paternalistic and benevolent policy initiatives had to be taken by the British government to sustain and reinforce the loyalty of its soldiers. Mass agitations by recruited groups and/or in areas of high recruitment were handled with unexpected alacrity, concern and tact. On occasion, extant government policy on the issues causing grievance was altered, even reversed. 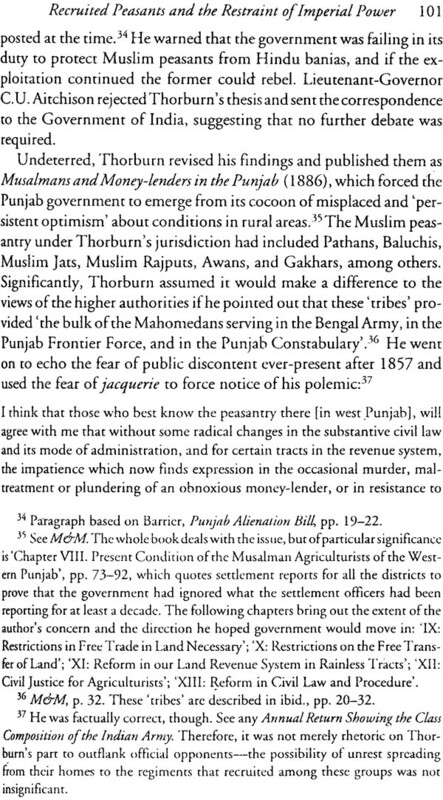 Through such examples of surprising concessions, both voluntary and forced, to its recruited peasantry, the policies of the colonial state in Punjab highlight the constraints on colonial power. 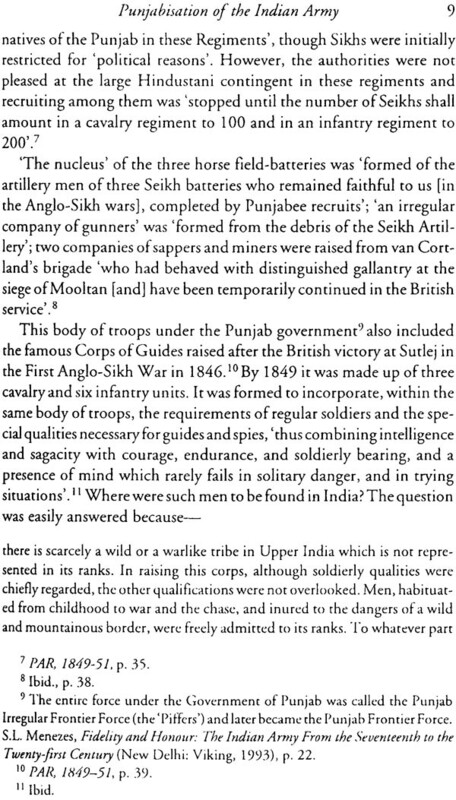 The British Indian army was at once the tool of imperial coercion and one of the largest sources of' employment'. While the army helped conquer, subjugate and control the empire, it simultaneously provided a regular and significant source of income to its soldiers. The impact of colonialism through the benefits of military service on those recruited was perhaps less exploitative than on the rest of Indian society. 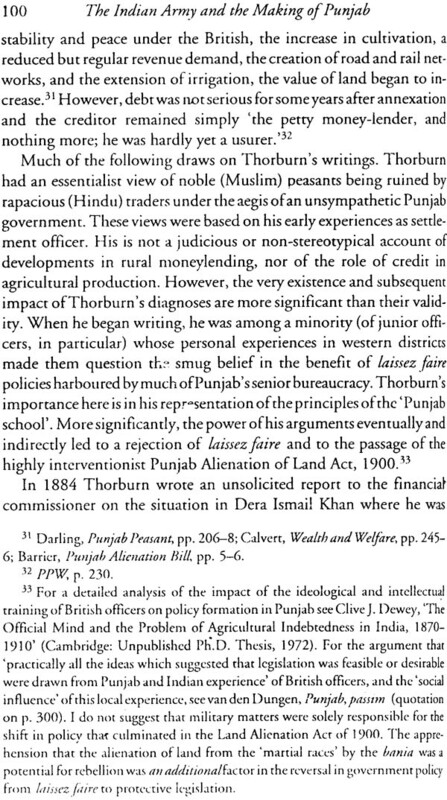 Punjab's recruited peasantry profited from military service in social and economic terms, and this affected their subsequent political outlook and actions. This brings up the third issue considered within this mono graphnationalism. The advantages of military service, and the perception that the government was benevolent to soldiers, affected the latter's attitudes towards the British. 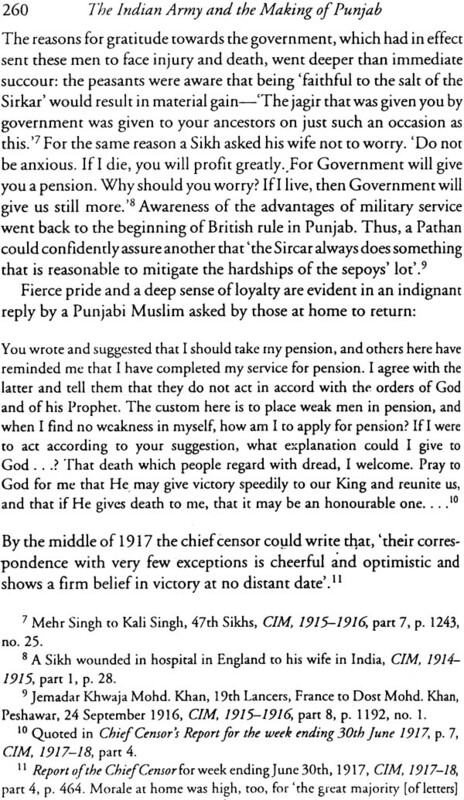 The nature of nationalism and the course of the national movement in Punjab were both affected by the 'Punjabisation' of the Indian army. Nationalism was primarily an urban phenomenon, though not absent from rural Punjab, and, given the demography of colonial times, its impact was correspondingly limited. The loyal ism of the recruited peasantry and the influence of military groups in rural areas across the province limited the influence of the national movement there. 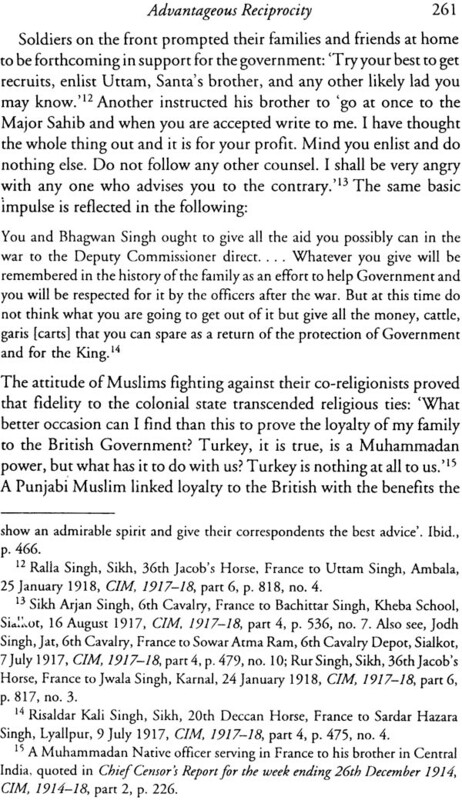 A 'subaltern' group (military men and their families) colluded with the imperial state to result in a uniquely loyalist political history under colonialism-best reflected by the electoral dominance of the Punjab Unionist Party until the 1946 elections. The broader impact of the Indian army had political reverberations on both colonialism and nationalism in British Punjab. 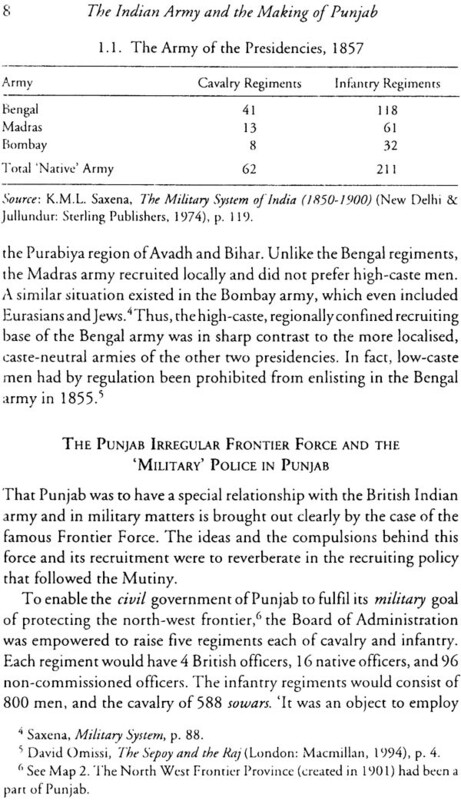 The military significance of the province was a result of high recruitment from among its supposedly 'martial races' after 1857, and of the geographical situation of Punjab as the frontier of empire. The first chapter of this book deals with the 'Punjabisation' of the army, whereby nearly half the total native army began to be recruited in Punjab. 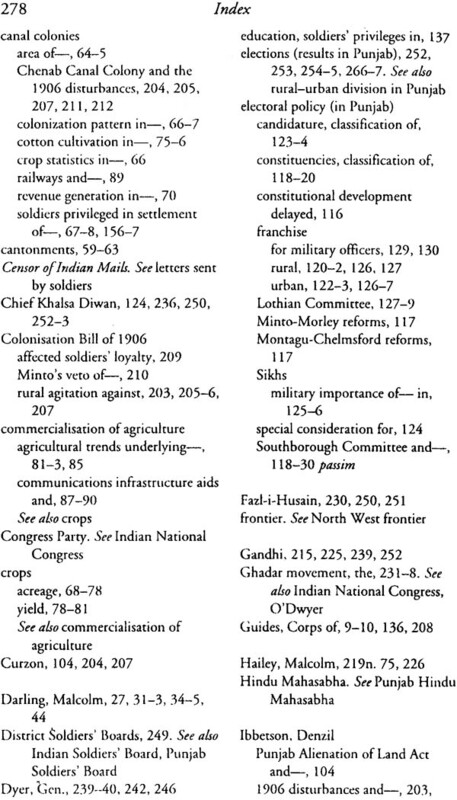 Military expenditure was the largest component of the colonial budget and 'regimental pay' was the highest segment within this expenditure. 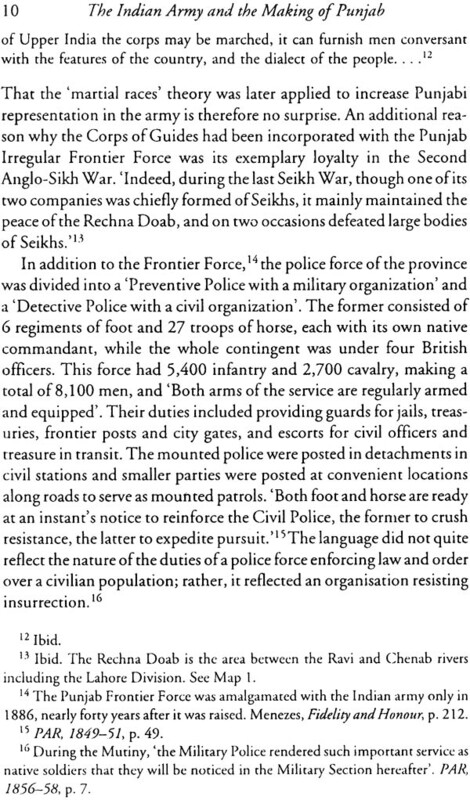 That such a high proportion of soldiers came from Punjab implies a hugely disproportionate share of military expenditure to a very restricted area, for Punjab was less than ten per cent of British India in population and in area. The first chapter, accordingly, quantifies the inflow of pay and pensions into the province and shows the possible impact of military incomes in military districts, and at the level of servicemen and their families. The overwhelming concern of military strategy in the late nineteenth century was to guard the frontier from possible Russian incursion. 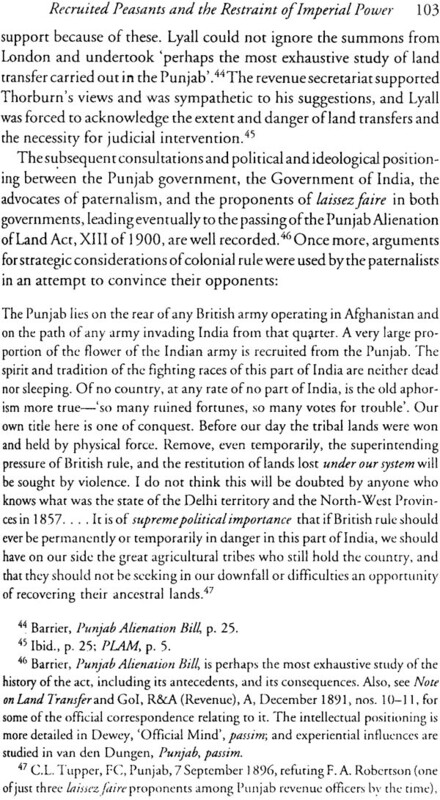 Chapter 2 details how Punjab, as the frontier of the British Indian empire, became the focus of all activity surrounding the military defence of this boundary. The building of roads, railways, and telegraph lines, and the construction of cantonments, were all the result of a purely military need, but their incidental consequence was to create an economic infrastructure. The construction of canal colonies opened up vast areas for cultivation, but the colonisation policy mainly favoured military men. Chapter 2 links the commercialisation and expansion of Punjab agriculture with strategic needs and the great irrigation works. 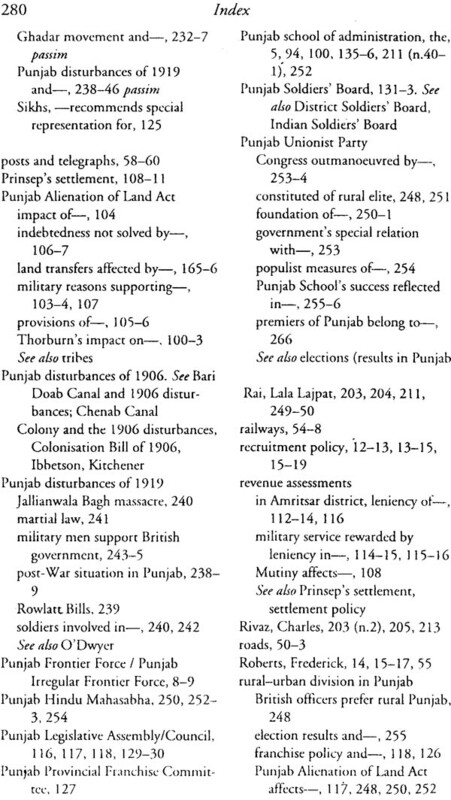 Chapter 3 analyses government policy in the context of the military importance of Punjab and suggests that the policy favoured the 'martial races'. 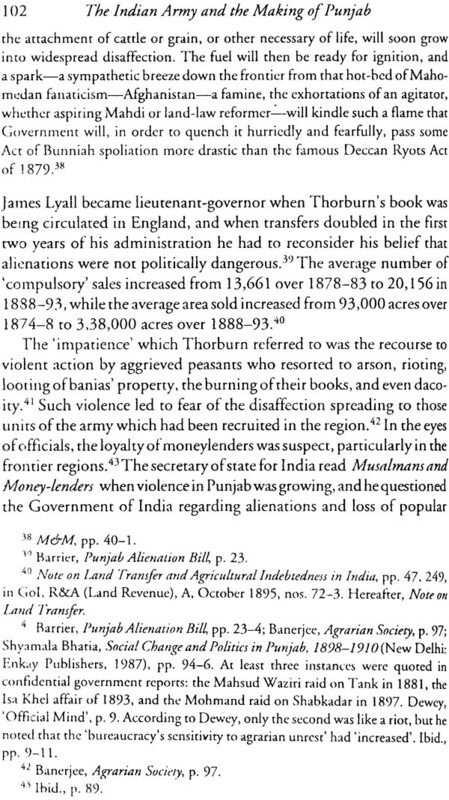 The colonial state's overall security was so dependent on Punjabis that it was forced to initiate measures aimed at pre-empring any possible causes for disaffection among the recruited peasantry. The Punjab Alienation of Land Act, 'political' revenue assessment, and specific legislative measures aimed at militarised groups need to be seen in light of state imperatives too. Government policy was also influenced by the need to invest the state's allies with greater power and privileges as indicated by canal colonisation, the franchise policy, the efforts of the Soldiers' Boards, and educational facilities for soldiers' families. 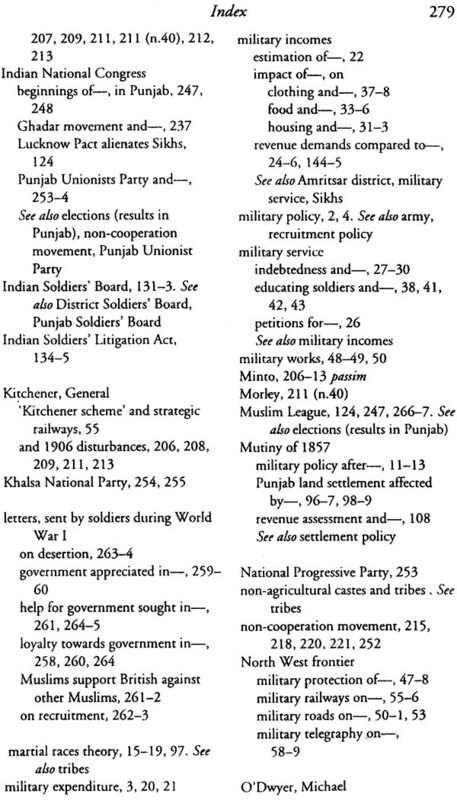 The first three chapters set up the proposition that Punjabis benefited from the recruitment policy, and from their subsequent significance for the security of the colonial state. 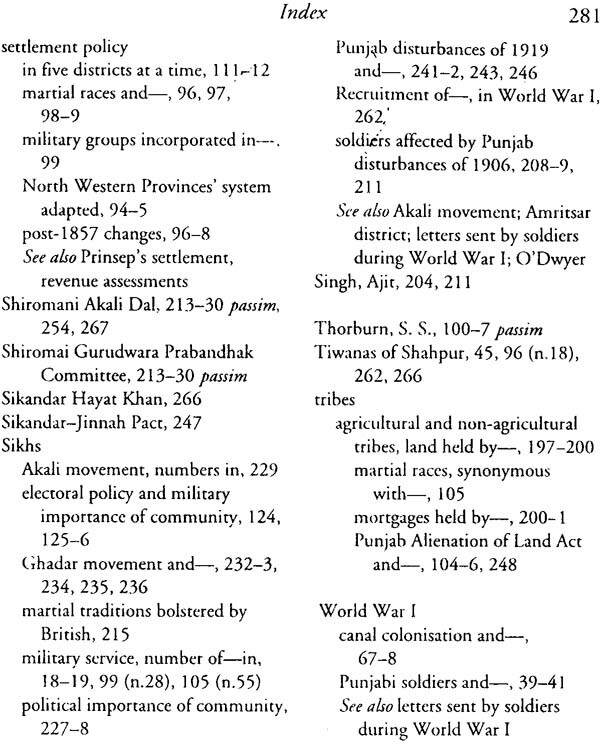 Chapter 4 studies the highly recruited Amritsar district in detail to examine the economic benefits of military incomes at the village level. 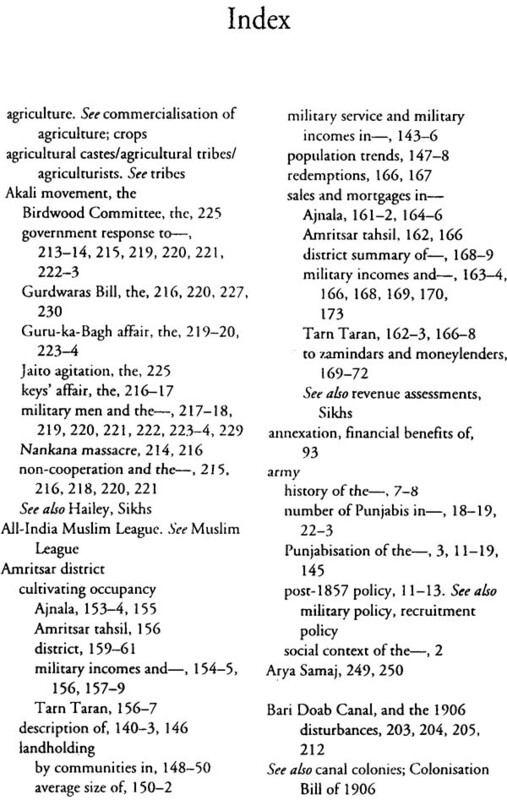 Analysis of its three tahsil indicates that the tahsil of Tarn Taran, where recruitment was high, per formed better than the more fertile Amritsar, and was also c1earlv superior to Ajnala which had fewer recruits and relatively poor agricultural conditions, In terms of the average size of holdings, ownership patterns, cultivating occupancy, indebtedness, sales and mortgages of land, alienations to moneylenders, and the value of land, Tarn Taran fared better than Amritsar and Ajnala over the entire seventy years reviewed. As most other factors were similar across this small and compact district of three tahsils, it seems plausible to suggests that military incomes positively affected economic conditions.